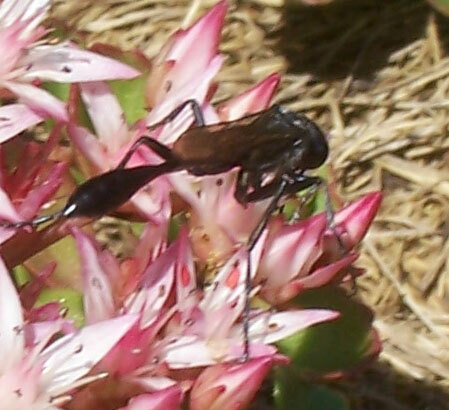 These wasps were in my lawn last year too in approx. the same area of grass. The sighting this year was today, July 16th 2007. It was about 4:15 on a sunny day. The air temp. was approx. 83 degrees. We live in Maine about 40 minutes north of Portland in a small town called New Gloucester in Cumberland county. I hope this info. was helpful in your research. Your website certainly was helpful to me as it stopped me from using the hornet and wasp killer I was intent on using. Now I know that they are beneficial and will leave them alone. Please answer me a question though. Is it safe to mow the lawn over their holes? So far they have not bothered us but I get nervous since it is my teenage son who does the mowing. Thanks for sending in these photos. You actually have two separate species of wasps here,and neither one of these is a cicada killer wasp. 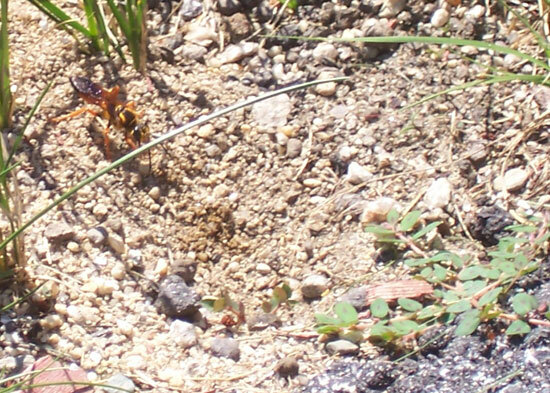 While they dig burrows in the ground like Cicada Killers, the one on the left is known as the Great Golden Digger Wasp - Sphex ichneumoneus and the one on the right is known as the Great Black Wasp - Sphex pensylvanicus. Thanks for sending in your photos. Hopefully, some day, we will find the Cicada Killer Wasps in Maine but as of today, so far no records have been found.